MSI Afterburner, despite its name, is a graphics card configuration tool that is compatible with a wide range of graphic cards and not exclusive to MSI cards. It is for instance fully compatible with a Sapphire Ati Radeon 4870 card of a Ghacks test PC. A rule of thumb is that MSI Afterburner supports most Geforce and Radeon cards provided that the drivers installed are not too old. Try updating the drivers if the video card is not recognized by the software immediately. The program does not work with cards from other manufacturers, e.g. from Intel. 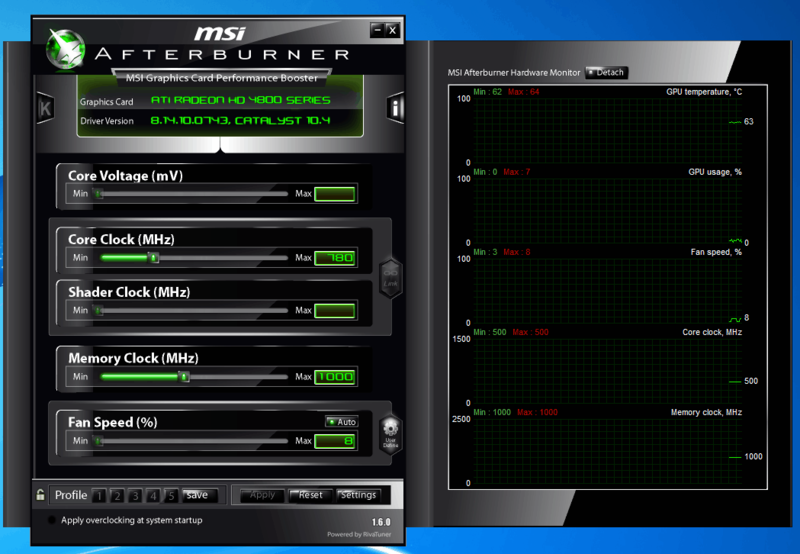 MSI Afterburner is based on Rivatuner, another popular video card configuration software. The installer is straightforward; note that you will install MSI Afterburner and Riva Tuner Statistics Server by default. You can disable the Statistics Server so that it won't get installed. It provides frame rate monitoring, on-screen display and video capture services. If you need those, keep the server enabled. The program displays a hardware monitor and core information about the graphic card on startup. It may use different skins to display the data; the default skin that you see on the screenshot above was displayed on one machine, and a more futuristic looking cyborg skin was displayed on another. A click on settings > user interface displays options to switch to a different skin if you don't want to use the selected one. The guide is based on the default MSI Afterburner 2 skin. The core information includes the graphics card name and driver version as well as the core voltage, core clock, shader clock, memory clock and fan speed. The availability of these values depends largely on the graphics card itself: if it is supported it should be shown. While you can run MSI Afterburner on unsupported video cards, you won't get much out of the program as most options are unavailable. Sliders are available to change the core parameters directly. The hardware monitor on the right side displays max and min values. These depend largely on the capabilities of the video card. It is for instance possible to see the graphics card maximum and minimum temperature, fan speed and core clock changes. Settings can directly be saved as profiles. This is handy for overclocking or underclocking the graphics card in specific situations. It is for example possible to create one standard profile, one overclocked profile for gaming and other gpu intensive tasks and one underclocked profile for situations where the graphics card is not needed at all to save power or tune down the fan to limit noise generation. The settings button leads to an extensive configuration menu. Here it is possible to change the behavior of the card's fan(s), the hardware monitoring, on-screen display and profiles among other options. 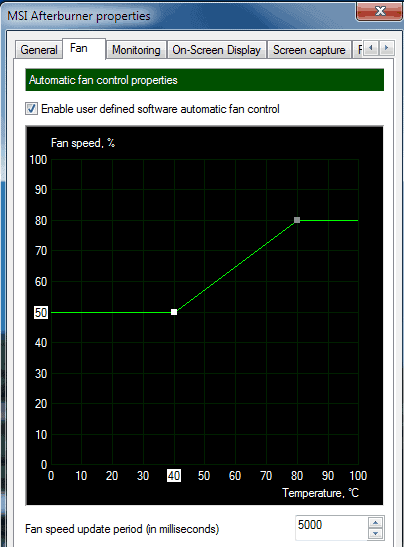 The fan speed controls can be changed from automatic to user defined. This opens a graph where the fan speed can be adjusted to the temperature of the graphics card. The fan speed could for instance be lowered if the gpu temperature is low and increased if the temperature rises. You can link different temperature levels to different fan speed levels to customize the fan speed of the video card based on that. Note that MSI Afterburner needs to run in the background for this to work. 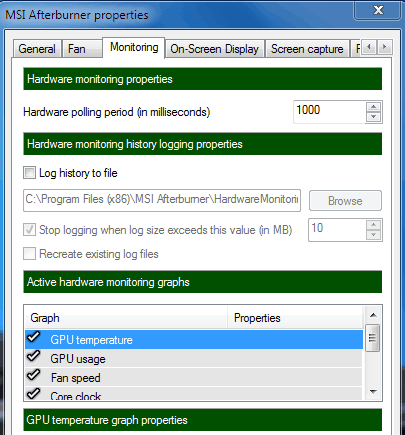 Hardware monitoring graphs can be enabled or disabled in this tab. It is furthermore possible to activate hardware monitoring history logging which can be helpful when you are troubleshooting video card problems. Hotkeys can be assigned to the profiles that have been created to switch easily between them. There is also an option to set automatic 2D and 3D profiles which will then be automatically enabled whenever the system uses 2D and 3D applications (meaning gpu-less and gpu intensive processes). An onscreen display can be configured in the MSI Afterburner software to display relevant information directly. This - and some other settings - require a server process that needs to be running in the background. Computer users with multiple gpus can configure the clock, voltage and fan speed individually or in sync. Check out our video capture guide using MSI Afterburner for information on how to do that. 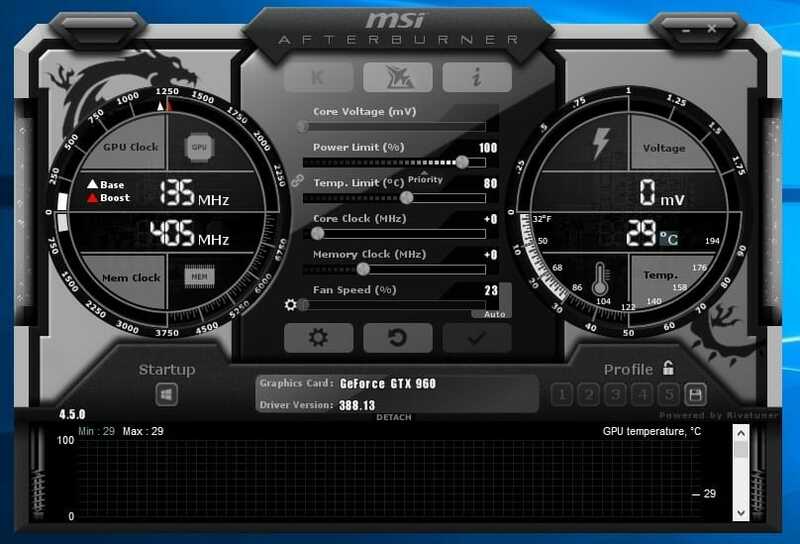 MSI Afterburner is an interesting tool for users who want to tweak their graphics card. The program is compatible with 32-bit and 64-bit editions of Windows XP, Windows Vista and Windows 7. Downloads are available directly at the MSI website.